Fail, Fail Again, Fail Better explores the nature of failure and our response to it as humans. 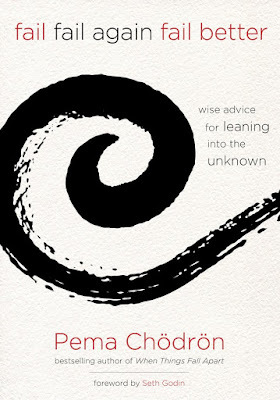 “So when Naropa (the University) asked for me the topic of my talk, I decided not to give it to them because I thought if I did, they wouldn’t let me do it!” says Pema Chödrön. Well, I wouldn’t be so sure. Commencement or graduation speeches nowadays are like the ancient custom of gathering to hear a prophet speak. A successful public figure passing his or her wisdom to young ones coming out of higher education has gained more traction in recent years. Millions of young people, even adults, now listen to these speeches and watch clips of them on YouTube over and over - it has become some kind of a geeky cultural norm. This is a good thing and has yielded wisdom and wonderful fruits over the years as commencement speakers ditched old scripts and boldly reached out from the wealth of their mind to inform the world about our reality as humans in its grimness and glory. Few notable commencement speeches in the living memory are David Foster Wallace, Kenyon, (2005); Steve Jobs, Stanford, (2005); and Jim Carrey, Maharashi (2014). There are other good ones on the internet somewhere. Since we are don’t have a crystal into the future, Pema Chödrön says we need to be good at “welcoming the unwelcome”, which is another way of saying we need to embrace failure and be a pro at dealing with it. Mastering this unusual skill, she says, has the capacity to do us good as long as we live. Fail, Fail Again, Fail Better is a fantastic talk and grandmotherly advice from an experienced woman – it’s warm, but strict, and most importantly, there is love in its tone. On the down side the book sometimes reads like a private journal. There is a bit of disjointedness in the transition of ideas from one page to the other. The instances where this occurred are minimal, though. Fail, Fail Again, Fail Better is simple in its sentence structure and the book format makes it easy for readers to relax into its message. The book itself has the potential to be life-changing and that is one of the things that excites me about reading. If you are in a position to grab a copy of Fail, Fail Again, Fail Better, please do. I think it’s great. Many thanks to Sounds True for review copy. All images are © to their respective owners.